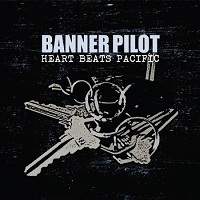 Banner Pilot - Heart Beats Pacific out October 25th! You heard it right, we’ll release Banner Pilot’s third full length Heart Beats Pacific on October 25th! Check the cover art below and view the track listing here. Banner Pilot will perform at Riot Fest this October and head to CMJ and Fest with Dead To Me! View their tour dates here. Read what Nate from Banner Pilot had to say about the release below. Then we thought, “Wow, we sound like idiots. How about we not do that?” Instead, we stuck to what we know and came up with 11 songs of melodic punk rock. Sometimes fast, sometimes a little more mid-tempo, hopefully always catchy. We did try some new things, but never in a way that’ll make you grimace and say, “Oh man, really?” We’re not reinventing the wheel on this album. We’re just adding some new touches to the wheel—-say, putting spinners on it—-to make it extra awesome. Is it safe to say that our new album Heart Beats Pacific is like Collapser on steroids, in the sense that we beefed up the songs and suffered absolutely no adverse side effects in the course of doing so? Yeah, I think it’s safe to say that. We’re all really excited about the songs on this record, and how the record ended up sounding, and we hope you like it too.